The Mike Horse Dam burst in 1975, spilling tons of toxic mine waste into the headwaters of the Blackfoot River in a disaster that marred the land and created an ecological wasteland. Now, decades later, Mike Horse is one of the state’s most important environmental cleanup sites with a goal to restore the river system and benefit fisheries, wildlife, the Upper Blackfoot Valley, and the people of Montana. Since 2008, Pioneer has provided environmental, civil, and geotechnical engineering services on this state Superfund site along the Upper Blackfoot River near Lincoln, Montana. Overall, Pioneer provided characterization services, completed a feasibility study, and assisted in designing an emergency spillway rehabilitation. Pioneer also completed repository, tailings, and dam removal and river restoration designs as part of this on-going program. Click for the Pioneer full project description. Geotechnical evaluation and recommendations for construction of a conduit through existing Mike Horse Dam to mitigate potential dam failure/tailings release. Geophysical and geotechnical investigation of potential repository sites, including evaluation of slope stability during seismic events to maximize cost-effectiveness. Geotechnical laboratory analysis of site materials including triaxial shear tests, unconfined compressive strength, hydraulic conductivity as well as more common analyses such as gradation, water content, Atterberg limits, and moisture-density relationships to support the geotechnical engineering analysis. Soils and tailings evaluation to support de-watering design to accommodate tailings removal. On-going construction oversight and testing. Currently (2016/2017), the Montana Department of Environmental Services (DEQ) is presenting the Mike Horse project as a banner project on their website. Pioneer continues to assist with repository siting investigations for the tailings from the dam and tailings pond. 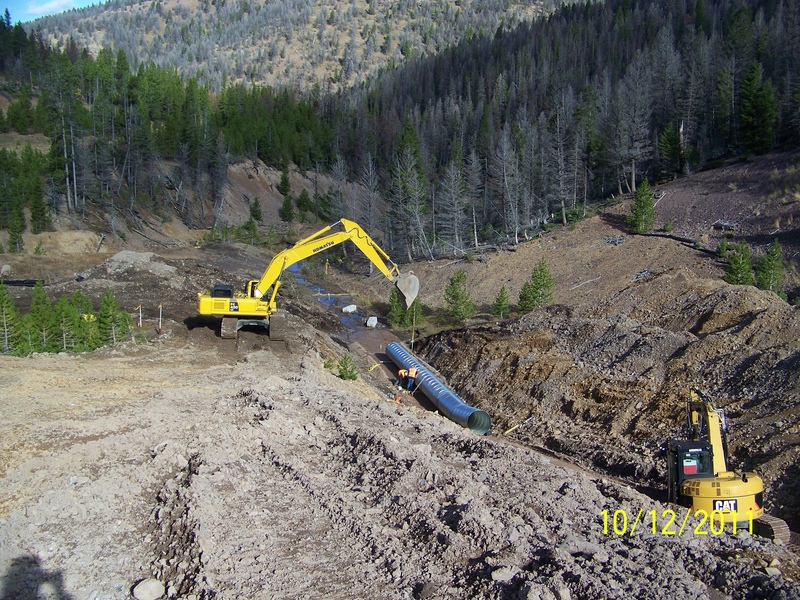 2017 Update: Pioneer provides engineering and environmental remediation services to the Montana Department of Environmental Quality (DEQ), Natural Resource Damage Program (NRDP) and other agencies under the watershed restoration agreement. The Mike Horse Dam – Upper Blackfoot Mining Complex (UBMC) – project is currently in the fourth year of construction with completion expected in 2018. The Montana Environmental Trust Group (METG) is showcasing the Mike Horse project on their site here. 8/2017: Additional information about the current status of the work is here. 2016 Award: The Montana Contractors’ Association presented an Environmental Excellence awards to this project. The UBMC Phase 2 project won the Special Recognition – Water Quality award. Details on the project. 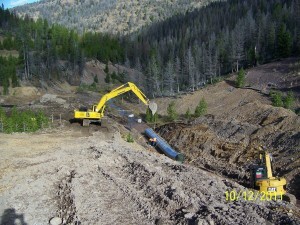 Photo below shows Installation of new conduit through Mike Horse Dam. The project was to design and construct a 350-foot long emergency spillway through the Mike Horse Tailings Dam.